Break-mandrel fastener that consists of two parts. It provides an ample bearing area on both sides of the application that makes it ideal for the fastening of low resistance materials. 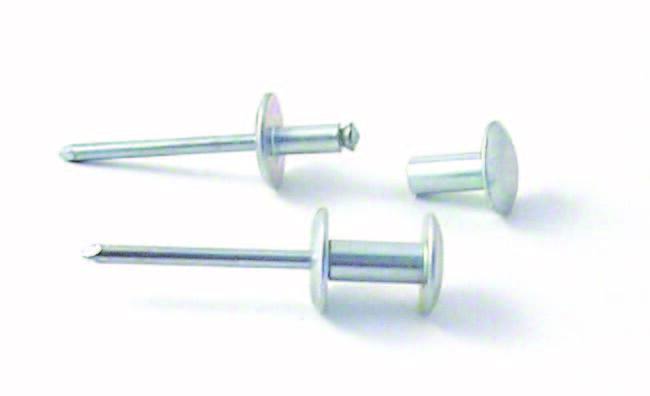 Bralo Gripmate Rivet is a multiple part that consists of a special steel rivet and a semi-tubular piece, also made of steel. It is especially suitable for applications where there is a large thickness that has to be fastened and also for soft or brittle materials, since the heads are large on both sides of the part and it has a wide bearing surface. It provides great resistance without damaging the surfaces of the application. Bralo Gripmate Rivet guarantees a homogeneous riveting with an excellent appearance on both sides of the application. The formation of two opposite heads on both sides that provides a large bearing area, distributing the force. Recommended for use in applications with soft or low strength materials (plastics, fibre, wood). Excellent appearance on both sides. The mandrel rupture takes place inside the rivet and the semi-tubular piece so the mandrel does not come loose nor can be lost after the setting. It covers a wide range of thickness to be riveted. To be used with ergonomic tools, both manual and pneumatic. Playground and other groups equipment. Diameters: 4.7 mm., y 6,3 mm. Heads: Large head on both sides.